Sailing with the Pigs: Where Do Ideas Come From? My fabulous brother-in-law HP owns a 2-cabin, ocean-going sailing ship that he docks at Bainbridge Island in Puget Sound. We’ve gone twice to sail with him, and it’s a blast. There’s something about letting the wind carry you across the water with no other means of propulsion. Wind in your face. Cold. Thrilling. I wanted to write a story about sailing even before we went on HP’s boat. But after? Well, I had to, right? To that spark, I added my growing interest in sailing. I’ve always heard of “Sailing the Seven Seas.” What did that mean? Turns out there are about 54 seas named on Earth. There are seven which are the largest and are usually considered the most important, but the list varies from place to place. For me, nonfiction research like this helps flesh out the setting and bring ideas to life. I love tall ships, too. When we were in Seattle, we saw the figurehead of one of the fastest tall ships ever. They set records sailing from places like California to India. Amazingly, one of the most popular and profitable cargo was ice! Fresh Pond in Maine was the source of much of the ice blocks. They cut huge ice blocks and packed them in pine straw in a ship’s hull. They couldn’t do the runs in the dead of winter because of weather. By the time they did an ice run in the spring, the weather was too warm. About 1/3 of the ice melted en route. But that 2/3s was packed into an ice house in a far flung place. And it sound like gold. Another fascinating setting! The Ice Captain in my story sprang to life. So, you’ve got pigs who start out on Mr. MacDonald’s farm, but you want them to sail. How do they get from middle-America to the sea? Again, I turned to geography and studied different routes. The tall shipa and ice ships set the story in mid 1800s, so I went looking again for settings that would work. Of course, the pigs would need to cross the Mississippi River going east. Voila! That would be a magical crossing to a land called Liberty, where any intelligent animal or creature could get ahead in the world. Throw in a dark secret for the Ice Captain and the story started to come together. Finally, after a long gestation, the book comes out tomorrow! Here’s the official blurb. Find it at your favorite online bookstore, or order locally. It’s also available from all education distributors in print or ebook. 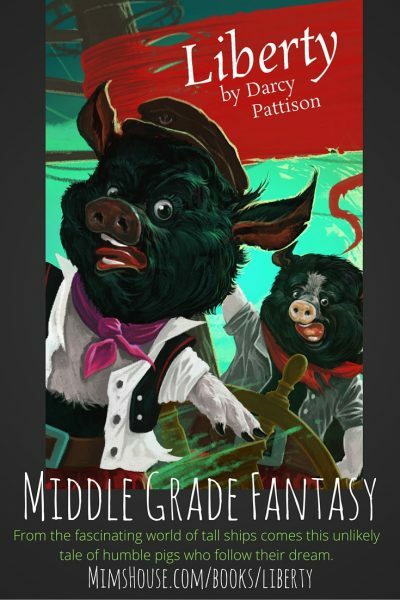 When Santiago is thrust into the farm’s pigsty, Penelope is captivated by Santiago Talbert’s boast, “I plan to sail the Seven Seas.” Together, these extraordinary pigs escape the farm and cross into the land of Liberty, a parallel world where an intelligent human or animal can get ahead. They follow their dream to Boston harbor, where they try to convince sea captains that pigs can sail. First, though, Santiago learns mapmaking, while Penelope works on the docks loading ships. Eventually Penelope signs onto the Ice King’s crew as he cuts and packs ice to ship to the far-flung corners of the world. When the fleet of ice ships sails, Penelope and Santiago join the crew of the flagship, captained by Captain Kingsley, the Ice King himself. A massive polar bear, he harbors dark secrets, and the pigs face the shocking truth: they alone can save the friendly sea serpents from the Ice King’s clutches. From the fascinating world of tall ships comes this unlikely tale of humble pigs who follow their dream. All formats are also available on Mackin, Follett, Permabound, and Ingram.